a laureate of young interprets'competition in Brno, he interpreted Clarinet Concerto composed by old master of Czech origin Karel Stamitz on Prague Spring Festival and guest-appeared as a soloist of saxophone and clarinet literature with leading Czechoslovak orchestras. Slovacek became a much-sought-for interpreter of the compositions of the "third stream", especially of its leading composer Alexej Fried, his recordings of Fried's compositions Moravian Wedding (with Gustav Brom big band), Fried's two clarinet concertos, Quintet for Soprano Saxophone and string quartet, inspired by and named after Pablo Picasso's Guernica, attracted great attention. 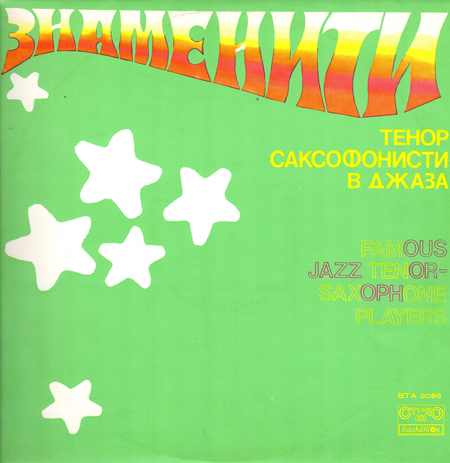 You will find some of these compositions as well as Concerto for Alto Saxophone and Alexander Glazunov String Orchestra on Supraphon record 1110 2750. If we can say, that classical music has been an occasional menu for Felix Slovacek, popular music became daily bread for him. He started his musical carreer as a member of Mirko Foret Dance Orchestra in Brno, but he soon attracted the at-. Tention of most famous Czechoslovak band-leader Karel Vlach. 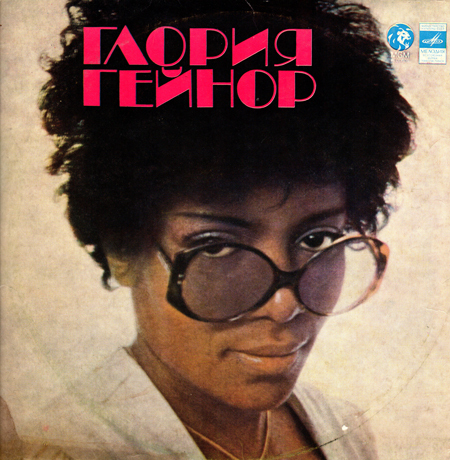 This Prague orchestra opened him the path to Ladislav Staidl Orchestra, well-known also as an orchestra accompanying Czechoslovak pop singer No. 1 Karel Gott. Felix Slovacek asserted himself step by step through his instrumental turns on concerts of this pop star and became thus the first Czech instrumentalist, whose fame surpassed the popularity of many even outstanding singers. 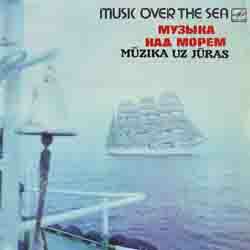 He recorded 6 LP's for Supraphon and Polydor Hamburg labels. 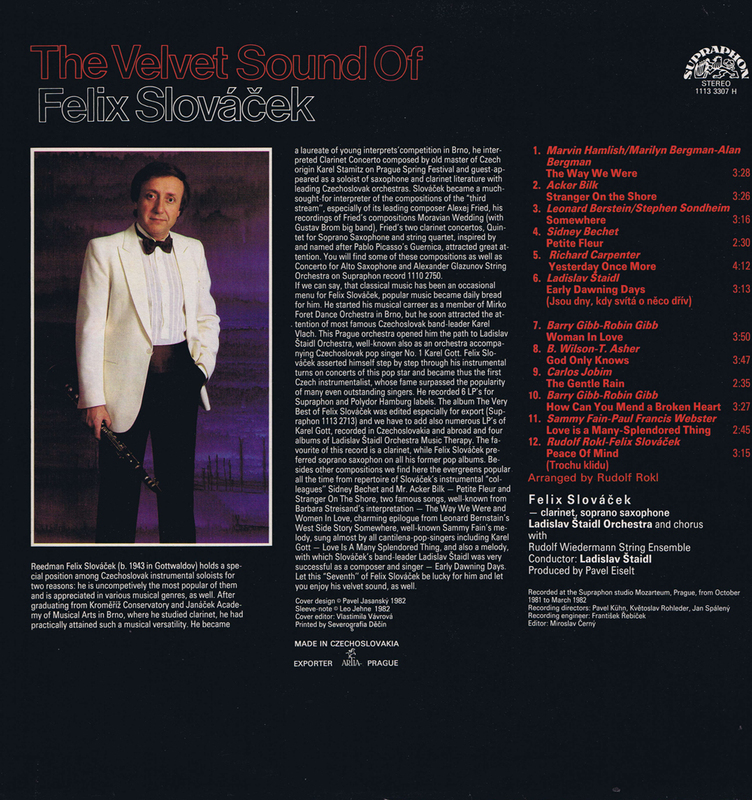 The album The Very Best of Felix Slovacek was edited especially for export (Supraphon 1113 2713) and we have to add also numerous LP's of Karel Gott, recorded in Czechoslovakia and abroad and four albums of Ladislav Staidl Orchestra Music Therapy. The favourite of this record is a clarinet, while Felix Slovacek preferred soprano saxophon on all his former pop albums. Besides other compositions we find here the evergreens popular all the time from repertoire of Slovacek's instrumental "colleagues" Sidney Bechet and Mr. Acker Bilk - Petite Fleur and Stranger On The Shore, two famous songs, well-known from Barbara Streisand's interpretation - The Way We Were and Women In Love, charming epilogue from Leonard Bernstain's West Side Story Somewhere, well-known Sammy Fain's melody, sung almost by all cantilena-pop-singers including Karel Gott — Love Is A Many Splendored Thing, and also a melody, with which Slovacek's band-leader Ladislav Staidl was very successful as a composer and singer - Early Dawning Days. 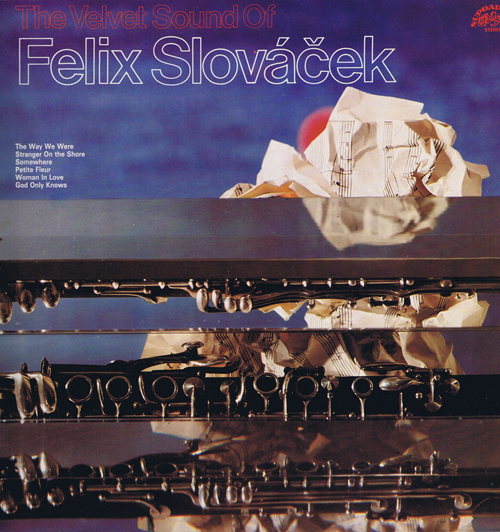 Let this "Seventh" of Felix Slovacek be lucky for him and let you enjoy his velvet sound, as well.